Allan Lindsay “Chopper” McKinnon founded Canadian Spaces, the longest-running folk music show on Canadian community radio. He hosted the popular CKCU-FM show for 33 years until his death in March 2013 at the age of 66. Born in Manitoba, Chopper’s family eventually settled in Ottawa. Chopper found himself drawn to live local music performances while attending Ottawa’s Woodroffe High School in the late sixties. He was a founding member of the Bytown Live Entertainment Association that organized the legendary Sunday evening “hoots” featuring amateur musicians. Chopper also co-owned the Toronto Folklore Centre for a few years and worked as a record producer for artists including Willie P. Bennett. For CBC Radio’s All in a Day show, Chopper worked as a music programmer. After founding Canadian Spaces in 1980, the show soon expanded from one hour to two and became a top fundraiser for the station during annual funding drives. 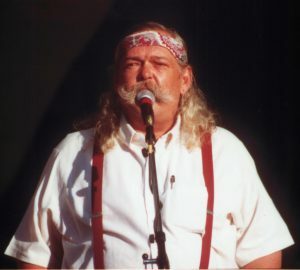 Chopper became a popular emcee at the Ottawa Folk Festival and other local folk music events. Across Canada, Chopper was known for his encyclopedic knowledge and enthusiastic support of Canadian folk music. Local musicians such as Lynn Miles and Ian Tamblyn praised Chopper for his invaluable support, encouragement and friendship throughout their careers. His legacy, Canadian Spaces, continues with host Chris White on CKCU-FM. Arthur McGregor the owner of the Ottawa Folklore Centre, wrote and performed this great song about his good friend Chopper.